You should already know about Snowbirds from SPLASH 2, and if you've looked them up, "Beautiful Morning" ought to have caught your eye - or ear. It's one of their best, and the perfect twee song. Fast and sweet like a sugar rush. 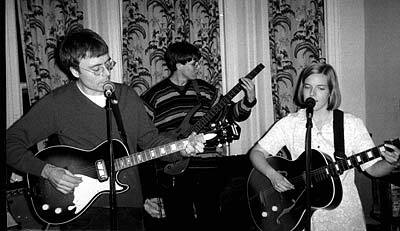 Here it is, but by another one of my favourite twee groups: Bella Vista, Mark's pre-Pipas band. They did the third ever release on Matinée Recordings: the sold out Was the Last EP, as well as another single and one split. I'm a bit confused as to where this cover comes from though. On the split, The Best Wishes do a cover of it, but this recording definitely sounds like Bella Vista. Have to ask Mark! The Bella Vista version is slow and jangling. Being almost twice as long as the original, I hardly recognised it at first! They've also done an (incredibly enough) superior version of The Carousel's "My Boy and His Motorbike". They deserve to remembered, if not only for that.